It’s no surprise to anyone reading this that survey after survey shows American’s stress levels have gone through the roof in recent months. Everyone, to some degree, is impacted by the financial crisis, whether it’s directly through a job loss or cut back; loss of savings through the stock market; higher prices at the grocery store; or reduced services provided by federal, state and local governments. What worries me (OK, stresses me out) is that more people will turn to food for comfort. Stress eating is already something 50 percent of Americans report they do, and a more recent survey shows that 82 percent of people say they have eaten in response to a stressful situation. It worries me because, as a news junkie, I’ve noticed the overweight/obesity epidemic has not only taken a back seat to the economic crisis in the media, but it’s been downright kicked out of the car along the side of the road. And now with everyone stressing out over money and jobs – and rightly so, this is a serious situation – chances are people are going to get even bigger than smaller as the financial crisis continues. That’s why I was thrilled to read (and highly recommend) “Stress Eater Diet” by Robert Posner, MD, and Linda Hlivka. This “diet” is normal and healthy – real food and no “cleansing” – and it places a strong emphasis on mindful eating, behavior modification, and stress-reducing techniques such as deep breathing, meditation, yoga and exercise. I was really glad to see the question, “Who are you losing the weight for?” asked almost right away. God knows enough of us have lost (or are are still losing) weight “for” someone else, “for” something else, like “just for me” isn’t good enough. The “spin” to this diet (and you know every diet has a spin) is its emphasis on serotonin imbalance. The authors recommend eating foods that contain tryptophan (an amino acid essential for normal growth and metabolism). Foods include: turkey, chicken, fish, pheasant, partridge, cottage cheese, bananas, eggs, nuts, wheat germ, avocados, milk, cheese and legumes. They also want us to get out in the sun more. Another big reason I can recommend this diet is because it encourages journaling, both food and emotions. Long-time readers, you know I’m all about journaling, even before you start to lose weight. Figuring out WHY we overeat, WHY we treat ourselves the way we do, and WHAT we eat can help us develop personal strategies for overcoming old patterns. The book includes several other practical tips like how to reduce stress in the car, managing stress and anger, and how to “sniff” away stress. They recommend one of my favorite essential oils: frankincense. I always thought it was some ancient perfume long buried in the ruins of old Bethlehem until I found some at the place I get a massage. The heart of the book is the actual diet. The last section deals with stress-reducing foods and outlines a four-week eating plan. It includes the best explanation I’ve read on why it’s important to “eat your colors,” and what those certain foods do in terms of health benefits. The meal plan gets two thumbs up. There a lot of emphasis on protein, fruits and vegetables, and while the plan suggests several kinds of meat, I can see how it could be easily adjusted to accommodate those of us who choose not to eat meat. 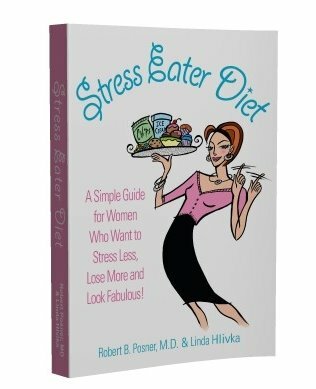 The Stress Eater Diet authors also write a blog. I’ll be adding it to my blog roll. And while most of you probably realize if you eat when you’re stressed, the Stress Eater Diet website offers a Stress Eater Quiz (click the link). It’s also in the book. So, who wants to win this book? Leave a comment about stress and how you deal with it. I’ll “draw” a winner on Tuesday! This entry was posted in Uncategorized on February 21, 2009 by Lynn Haraldson. I’d like to win this book. As for stress, I thought I had a handle on recognizing it and not stuffing my face, but something happened yesterday that is proving otherwise. So I guess I’m not quite in balance yet. I know I eat from stress and sadness. My poor kitty got very sick very suddenly and we had to have him put to sleep last Tuesday. I was an emotional wreck and let my eating get a bit out of hand. I use exercise to reduce stress. Going out for a good run, or lifting weights is a great way to get out the tension.I have also started doing some hatha yoga. There are some free audio downloads at yogadownload.com They are quite fun! I have known for a long time that I eat because of stress and loneliness. Since the beginning of the year, I have lost 12 pounds and have done very well at controlling my reaction to life and the curves it throws me.Last week, my Dad had a triple bypass and it threw me for a loop. I am visiting him this weekend and I feel like a fish out of water — I left my husband and son back home and flew here to visit Dad. All of the old stressors are coming back and I am surrounded by people who LOVE food…my brother is on a sentimental journey of looking for his favorite foods. He has to stop at a convenience store because they have some kind of cupcakes. I am watching him eat junk all weekend. He bought more junk for his room. I cannot say anything to him as he’s already been very dismissive and critical of my healthier choices but it saddens me to watch. He is 40 years old and acts older than my 76 year old father recovering from surgery.I have done very well this weekend…found time to exercise and made decent food choices but I feel the walls closing in. I just want to make it through the weekend and get back to my normal. I would like to read this book to learn how to handle such situations better! I like your advice: “Do not feel as though you have ruined the day and might as well eat everything else in sight. Start fresh from that moment on.”I am taking a similar approach to my weight loss efforts. My motto is:“Maybe I didn’t do everything perfectly yesterday. That’s no excuse for messing up today. Today is a new day, and I get a new start today.”As far as stress, I am just letting it go. With my attitude that every day (or hour, or minute) is a new start, I just don’t dwell on past mistakes. No stress at all.Of course, now I’ll stress out worrying about whether I’ll get the book. (:Best wishes to you! I have been a combination of stress eater and an emotional eater for a really long time. I don’t always realize that I’m doing it, until after I’ve “pigged out,” and felt guilty over the whole deal. And then there are moments that I just don’t care, and go ahead with it anyway. If I can remember to exercise, it does help. It’s just a matter of being able to do it at the time! Moonduster, I’m very sorry about your kitty. It’s so hard to make that decision and even harder to go through with it and live with the sadness of their parting. Shelley, I hope whatever happened yesterday corrects itself soon. I guess you can look at it as recognizing more about how you handle stress. Every situation can teach us something, right? (I’m always trying to look at the bright side)Lori, thanks for the link! Beth, I hope your father has a speedy recovery. Sounds like you’re in a challenging place right now. I wish you the best as you stand firm in your resolve to eat healthy, despite what your detractor brother says or does. Food will not make your father better. You realize that. I wish that for your brother, too. Jim, love your motto! No sense in beating ourselves up for yesterday. Makes NO sense. I love how every new day is a new beginnings. Sounds corny, but it’s true. Thanks for reading and commenting! Don’t enter me in the drawing (I have enough reading material in my face at the moment) but I wanted to comment anyway. I am a major stress eater. The only thing that seems to work for me is just feeling the emotions and sitting there crying ot being afraid or whatever emotion needs to be felt. That’s what I am running away from with the food, after all, so if I feel it, there’s no longer a need for the food. Lyn, that’s it EXACTLY. Feel the feeling. You can also be a third-party observer. Be curious about it. “Hmmm…so this is what sadness feels like….this is what stress feels like.” Thank you for this comment. I would love to win this book. I have been reading so many different diet and exercise books. Right now I am reading No Gym Required by Jennifer Cohen. I used to deal with stress by eating but the past few months I have starting exercising and I love the way the stress just rolls right off of me. Have a great evening. I exercise to relieve my stress and anxiety but it’s not always enough. Like Lyn mentioned sometimes I just have to cry it out and feel my feelings to be done with it. Of course sometimes I still find myself eating over stress but it’s definitely way less than it use to be. Sounds like a good book. Thanks for this great review! For me, exercise can definitely “take the edge off” (and keep me from blowing my top) but it’s important that I then follow up with my journal and see what REALLY triggered the upset which is often not what I originally thought. And once I get to the bottom of it, I then make choices about how to move forward. I learn a lot from your blog. Thanks. Stress eating for me usually involves driving home from school thinking “hmmmm, do I want a frozen coffee with extra whip or a bag of chips?” However, being back in school to earn my nursing degree has pushed me in the direction of change. I work with people every day who’s poor habits won out. I’m supposed to be a promoter of health and feel a bit of a fraud doing that with 60 extra pounds tacked onto my frame and a wicked stress/binge eating habit to boot. So I started Weight Watchers last week. So far, so good! I’m losing and sticking to the plan. Its not my first time on the program and its really the only thing that works for me. My problem is not necessarily weight loss, because even if I have a long way to go, I feel fairly confident that I can do it. But, I have a problem with maintenance, which I suppose is where this book comes in. The first time I did WW, I lost 30 pounds. I looked and felt great. Then I promptly turned around and gained 50 back. I think my problem was that I never thought once about maintenance – my “lifestyle change” was just a means to an end. This time I want to think about maintenance early so that I am prepared when the day comes. I’d love to be in the drawing for this book so I can start learning how to tackle these issues NOW. Thanks! I need to win this book, because no matter what I try, I always come back to eating when stressed. Thanks for the link, I need help. Have been following your blog for a couple of months now…you totally rock! Your writing resonates in my soul…thank you for using your talents to share your experience. I would love a copy of the book you reviewed…after months of thinking I “had it together”, a major life stressor has knocked me flat. I’m trying to get up and could use all the help I can get. Thanks again..keep up the great work! I searched my own blog to see if I use the word ‘diet’ (a lot). And what I found was if I am referencing a book or another person’s plan – where they use the word ‘diet’ – I use the same word. But when I am talking about myself – my thinking – I abhor the word. I use food plan. I am curious to know how you think about this word. And if you have already written a posting about this – I’d love to have the link. I would love to win this book. I thought that I had stress management down with exercise, a type of group therapy program, meditation, and healthy eating. But then a series of events brought about a two year period of chronic stress and those habits gradually went by the wayside and 60lbs crept back onto my waistline. Oi!So I’m starting again, trying to destress and take care of my body. Oops! I’m glad I came back and checked. I had written a comment, but then there was no funny word for me to type, so it wouldn’t let me post. Anyways, I said that knitting sometimes helped me stay calm, and I am going to write a blog post today about “I am not in control.” And that is the best stress reliever of all. I began my full on effort to lose weight last year, it’s a slow go and I don’t care, as long as it’s coming off. 23 pounds gone, 25 more to go. However, it was only about 2-3 months ago that I have been trying to tackle head on my stress eating -I have had some victories and some set-backs. I do almost anything to avoid stress eating…reading, exercise, I’ve been known to go to bed super early to avoid the kitchen and with that being said, I have succumbed to it many time as well. My new thing is to talk myself through it, actually talk out loud in my car or in my head. I’m starting today, I’ll let you know how it goes, but I can use a lot of help!! !